In my opinion, finding a finishing face powder is always going to be problematic if you have anything other than ‘normal’ skin. If you tend to have an oily complexion you’re going to want a powder to prevent shine, but I have the opposite problem, I have dry skin – particularly around my eyebrows (I used to have eczema in one of my eyebrows as a child, which I’m sure is a contributing factor) also my forehead and around my nose can be pretty dry too. So I need a product that isn’t going to emphasise any dry areas, and also one that doesn’t dry my skin out further. Of course I look after my skin, I moisturise, exfoliate and do as much as I can to keep it in good condition, but if you suffer from dry skin you’ll know no matter why you do, it just seems to keep coming back! 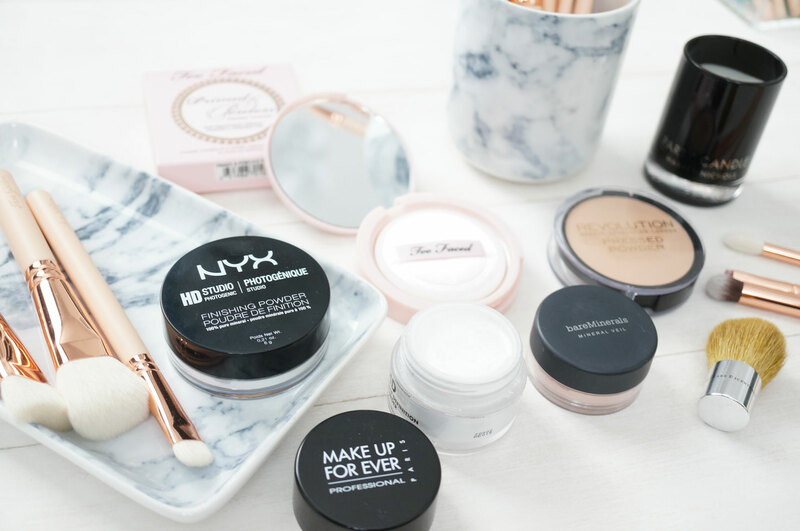 So today I thought I’d share with you a selection of finishing powders I’ve been trying out recently, they range from £2.00 to £24.00, so let’s see which comes out on top! 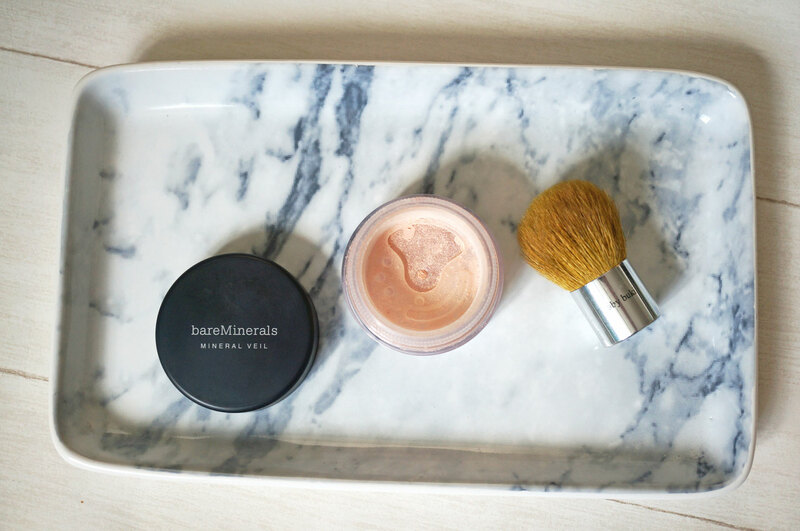 First up is the Bare Minerals Original Mineral Veil (£21.00) Now this, I love. I was initially a bit wary of this powder at first, I thought surely it’s just going to dry my skin out further and make it look worse? But Bare Mineral’s Mineral Veil is actually fantastic for dryer skins. It doesn’t contain anything that will dry or dehydrate the skin further, and because it has a super light texture, it’s easy to wear without feeling ‘caked on’. Mineral Veil helps to minimise lines, absorb any oils, and just gives your complexion a flawless finish – it’s also completely translucent so it will suit any skin tone. I’ve got a dinky little brush with mine that’s perfect for carrying around in my makeup bag. You only need the tiniest amount of product, quickly buff it into the skin and you’re done! I love that this is so quick and easy to apply. Since buying this, Bare Minerals also have a few more options available, including Tinted, Illumination and Hydrating Mineral Veils. I’d be interested to hear if anyone has tried any of these, and how they compare to the original. Please do let me know! 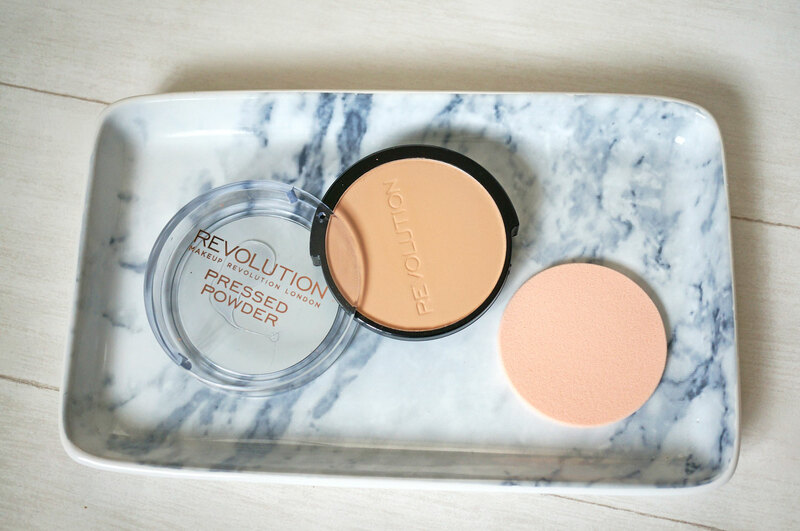 Next is the bargain of the bunch – Makeup Revolution Translucent Pressed Powder £2.00. TWO POUNDS I tell you! That really is ridiculously cheap! Anyway this little compact comes with a handy flat sponge applicator slotted into the back for easy application, it promises to even out your complexion, reduce shine, and set your makeup. I found the formula of this powder is actually pretty good considering the price, to be honest I wasn’t expecting much for £2.00, but it’s actually a nice little powder that’s soft and feels comfortable on the skin. On my ‘normal’ skin areas it was fine, but I probably would’t recommend it if you have dryer skin as it didn’t sit so well on my forehead. Also, this is supposed to be translucent, but it actually came out quite dark on my super fair skin so unfortunately I don’t think this product is for me. 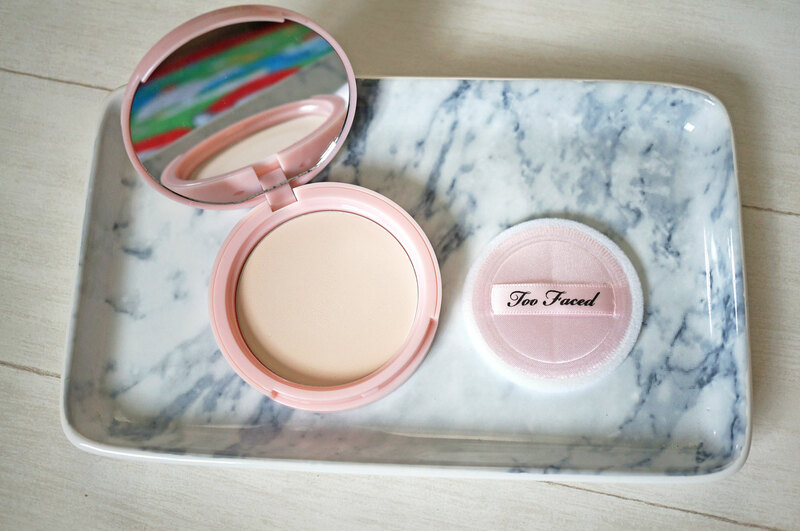 Too Faced Primed & Poreless Face Primer Pressed Powder (£24.00) As you probably know, I love Too Faced’s products, I’ve only recently tried their Cocoa Powder Foundation which I loved, so I couldn’t wait to put their Poreless Face Primer Powder to the test! I have a real problem with visible pores on my nose, a few around my nose, and also on my chin, so I’m always keen on trying any product that claims it will get rid of / tighten / cover them / erase them forever. The Poreless Face Primer Powder is quite the multi-tasker, it can be worn under foundation as a primer, on-top of makeup as a setting powder or alone for a natural finish. It promises that either way, you’ll still banish the appearance of pores and achieve a stunning, soft-focus look. It’s been formulated to minimizes the appearance of pores, fine lines and imperfections and it’s infused with vitamins A, C & E for antioxidant benefits and Mulberry Extract for a brightening effect. So how did this fare up? Well the powder itself has a super soft feel, and it comes with a cute mini powder puff and internal mirror which is handy for application on the go. Personally I prefer to dust this on with a brush, as I always seem to be a bit too heavy handed with the powder puff and end up looking quite white! This powder does actually seem to hide the appearance of enlarged pores – it didn’t completely disguise them but it definitely made them less obvious, and left my skin with a lovely smooth finish. 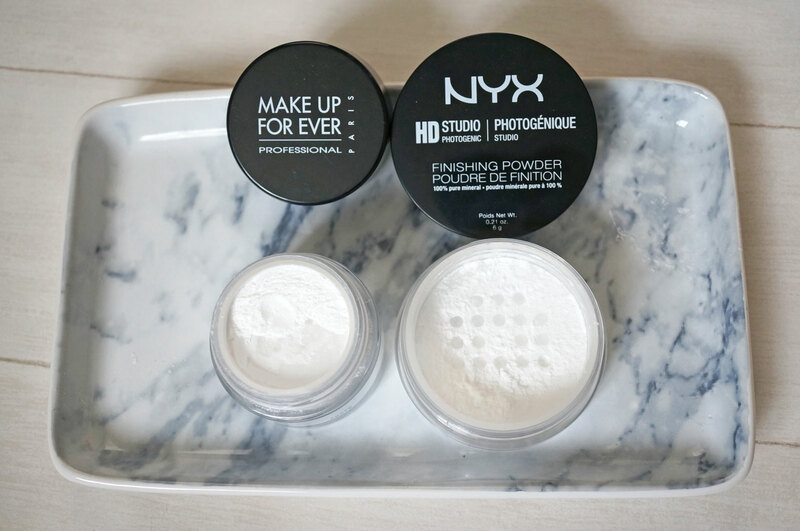 And lastly we have the Makeup Forever HD Microfinish Powder ($34.00) and the NYX HD Finishing Powder (£9.50) I’ve put these two guys together because they’re so similar. So if we start off with the Makeup Forever HD Microfinish Powder, this costs about £22.50 from Sephora (so also consider import fees if you want to buy) and at the moment I can’t see that it’s available in the UK – but please do let me know if I’m wrong. This little pot of powder has actually won three awards which is impressive in itself, it’s again a translucent powder that’s to be applied over foundation or worn alone. It’s made of 100 percent-mineral silica and sets the foundation and slightly mattifies skin, it also softens the appearance of imperfections, fine lines, and pores and completely evens out the complexion for a glowing, radiant look. Now I love this powder, it’s easily the most finely milled of the bunch, when I dabbed my finger in it I actually couldn’t feel the powder on my skin because it was so fine! One one hand I have to say I prefer pressed powders for convenience, but I think this definitely wouldn’t have the same effect if it was in pressed form. This is a fantastic powder for buffing over foundation to give a flawless finish, and it leaves your skin feeling unbelievably soft to the touch. So lastly I have the NYX HD Finishing Powder. At less than half the price of the MUFE powder, I was really surprised by how similar they are. Yes you do get less product (6g vs 10g) but it’s less than half the price of the MUFE powder and yet very much the same thing. This is also 100% pure mineral silica powder, and basically does the same job as the Makeup Forever powder. The texture feels the same and the finish is the same on the skin. So if you’re thinking of going for the MUFE HD powder, I’d definitely recommend you check out NYX first! 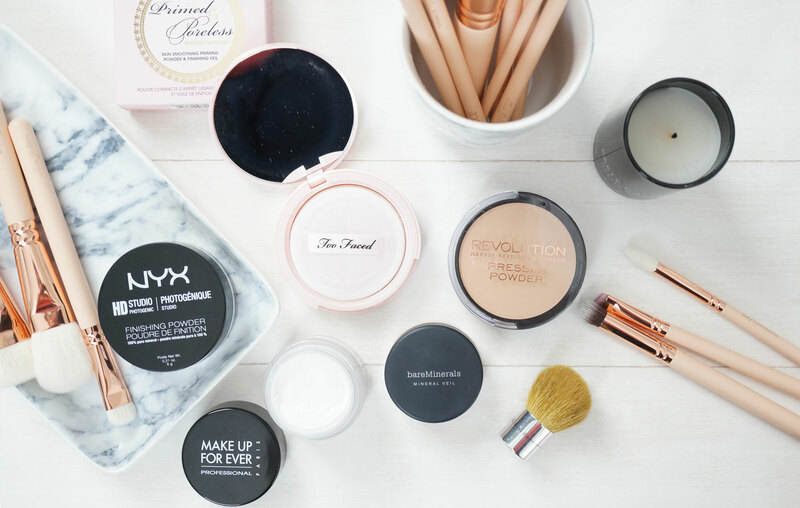 Apart from the Makeup Revolution powder, which was actually pretty good for the price, just not suited to my skin, I’m actually impressed with all of these products so it’s really hard to choose a favourite! I’ld love to hear what you think? Do you have a favourite finishing powder? The Too Faced one is too pretty! You’ve spoilt us for choices!